The Sewing Hayseeds Club has been around for almost 40 years, but prior to the name change, the sewing club was a staple in the 4-H organization. “There’s always been a sewing club. We’ve always been around,” said Marrison. Each year, the group can range as few as six members to 20. At the first of the year, the Sewing Hayseeds begins, and it ends after the County Fair in August. at any skill level, from novice to master. Beginners start with the first class, “Sew Fun” project, where they learn about sewing machines, reading patterns, basic sewing techniques and necessary tools. During the first year, students can choose to make a skirt or capris pants. “One year builds on the next. We have had students that work their way up to coats, suits, bathing suits and even formal dresses,” said Marrison. Along with learning a fun trade-skill, students are also taught soft-skills, like communication and leadership. “There are other things learned aside from a needle and a thread. They are learning about good citizenship, and how to give back to their community,” said Marrison. As an avid volunteer and leader in various community service projects, Marrison believes it is vital for students to understand the importance of community. “We all have to live in our community, and if we don’t give back, we’ll be in sad shape. If it’s learned at a young age, they’ll continue for the rest of their lives. Our kids need to learn that they matter in their community. If you don’t want to be a part of the problem, be a part of the solution,” said Marrison. As a strong advocate of volunteer-based work, Marrison has been involved with (but not limited to) the Farm Bureau board, the Senior Services Levy board, the County Commissioners’ Budget Advisory board, and is an active participant in the Jefferson United Methodist Church. After first graduating from college with a major in Home Economics and Education, she worked as a Home Economics teacher at Pymatuning School until becoming the Career Advanced Coordinator for Ashtabula County for 17 years. Marrison has also worked as the New Lyme Township clerk for 32 years. Each year, students from the Sewing Hayseeds club plant between 180-190 geranium flowers in front of veterans’ headstones at the local cemeteries in New Lyme Township for Memorial Day. “It’s a big deal for the group. People come up to the students and thank them,” said Marrison. Over the years, 4-H has evolved, and Marrison has witnessed the transformation first-hand. As 4-H continues to grow, Marrison hopes their attendance increases as well. “4-H involvement makes for a stronger country, a nation, a state, and local community. We are seeing kids out there doing these things, amazing things, doing certain community projects and we see how important it is. By being involved with various things, that’s where they learn how to take on leadership roles. 4-H plants those seeds when they’re young, that you have to be a part of that community service and impact your community,” said Marrison. 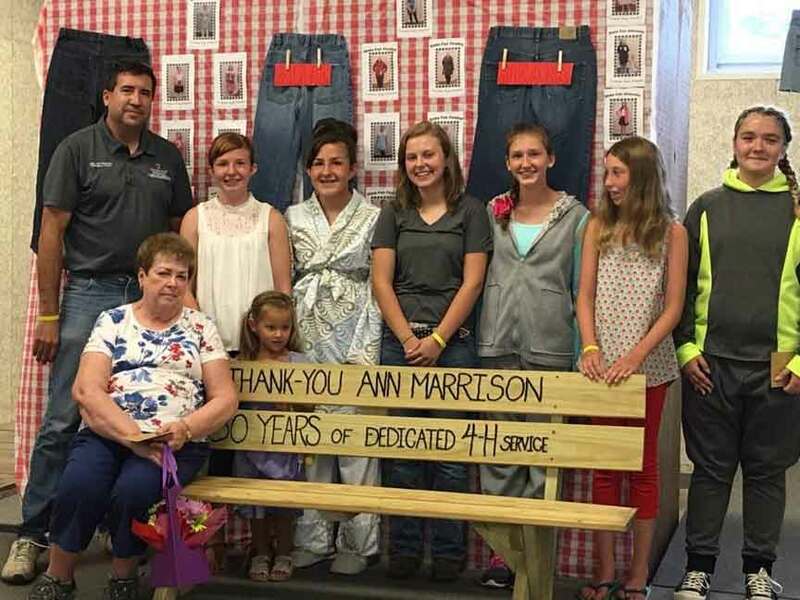 In 2017, Ann Marrison (seated, far left) was recognized for her 50 years of service as a 4-H Volunteer at the Style Revue with several of her club members.